The Emergency Manual Switching System - E.M.S.S. The Emergency Manual Switching System was designed to provide a skeleton long distance telephone service for Civil Defence, Military and Emergency Services should the normal public switched network be affected by enemy action. The system was closed at the end of the cold war in the early 1990s. 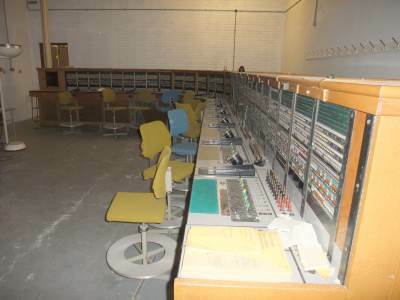 The Emergency Manual Switching System (EMSS) consisted of a network of 300 manually operated switchboards situated in the basement protected areas of Auto Manual Centres. They were sited here as they needed to be operated by trained personnel who would normally staff the public switchboard. There was an option to handle the EMSS calls on the 'Normal' peacetime switchboard. In the Post-Strike phase the EMSS would operate from the switchboard in the basement of the exchange building, providing telephone service to essential users during the recovery phase or it may be used during the transition to war, if normal telephone service were suspended or restricted by the Telephone Preference Service (TPS) described elsewhere on this website. The number of protected switchboard positions provided depended on the estimated privileged traffic through that exchange. In the Worcester switchroom which features in the gallery there are 12 switchboard positions. All the incoming and outgoing lines are repeated along the length of the switchboard suite so that all are within easy reach of all the operators. There are two and a half faces per switchboard. The lower part of the face, the answering section contains the incoming circuits, these repeat themselves every six faces, A0 - A5. The outgoing line in the upper section of the face repeat every four faces. Each operator position has fourteen pairs of plug ended cords, as seen in gallery image 3, limiting the number of simultaneous calls to that number. Unlike their public switchboard counterparts, the cord pairs do not have a time clock associated with them as calls are not charged. The operator answers an incoming call with an answering plug, which is in the row nearest to the switchboard face. The calling plug of the pair (row nearest to the operator) is placed into the appropriate outgoing line in the top section of the switchboard face. Within the switchroom is a test jack frame. Its purpose here is to switch the circuits from the normal peacetime switchboard to the apparatus room within the protected accommodation. Operating staff can switch from the normal switchboard to the emergency switchboard by moving the red plugs up from the 'S' row where they are currently situated to the 'N' row above. The third 'M' row is for monitoring and test purposes. The gallery shows a number of images of the apparatus room. The relaysets convert the signalling conditions sent down the external lines to those needed by the switchboard. Due to the importance of the Worcester EMSS as just one of six main centres, it has its own set of batteries and standby generator independent of the exchange's own batteries and generators. A special type of customer's line existed well before the Cold War period and continued until the telephone network became digital. 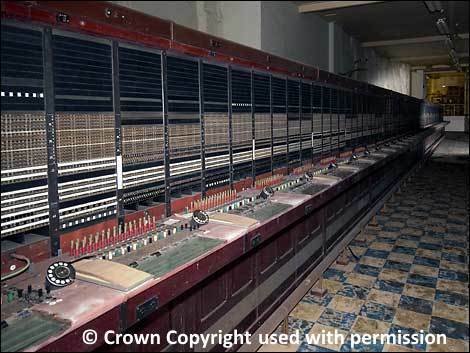 These customer lines terminated directly on the GPO public switchboard and were known as 'Trunk Subs' deriving their name from Trunk Exchange and Subscribers (the old name for customers). Typical customers would be the Police, Fire and Ambulance control centres dealing with 999 calls. When someone dialled 999 and asked the GPO operator for the Police, to save the time it would take to dial the control room's telephone number, the operator can plug into the Trunk Sub and be directly through to the Police control centre. Trunk Sub lines could also make calls, if they picked up their telephone, or plugged into it on their private switchboard, it called the GPO switchboard and was immediately answered by the operator. Additionally in the cold war period, a variety of privileged customers were connected as Trunk Subs. Military Establishments such as Armed Forces HQ (AFHQ). The U.K.W.M.O. Group controls. Local Authority Emergency Centres (LAEC) and Regional Government Headquarters (RGHQ) were typical users. This gave these priority access to the GPO switchboard operators and were not reliant on the automatic network. There were other civilian uses for Trunk Subs such as special phones at exhibitions, or to the Queen's train making an overnight stop in a siding. These privileged customers lines were given an anonymous Trunk Sub number. This meant that GPO operators never needed to know the identity of the Trunk Sub, as incoming callers would just ask for a Trunk Sub number in a certain town. For example, Mytown Trunk Sub 11 would ask for 'Anytown Trunk Sub 9' The call would pass through the GPO network from 'Mytown' until the 'Anytown' operator connected the call to its Trunk Sub 9. Neither operator needed to know the identity of the caller or called line. 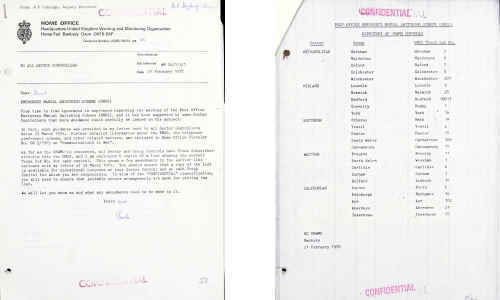 I am most grateful to Dave McKay G1JWG who forwarded an Annex to a National Archives File HO322/824 entitled Machinery of Government in War Communications Working Party, which he recognised was a sketch of the whole EMSS Network, saying that it appeared to be orphan unrelated to the rest of the file. This chance discovery has enabled me to create the network diagrams shown here. The EMSS network is built in three levels, the top tier comprises of six Emergency Through Switching Centres (ETSC) all fully interconnected. These handle long distance calls passed up from the tier below. The second tier has thirty five Emergency Zone Centres (EZC) Each is connected to two ETSC switchboards in the tier above and has sideways routes to one or more nearby EZC. The third tier of three hundred Trunk Group Centres (TGC) would appear to be connected to two switchboards in the higher tiers. More information about the third tier of the network would be most helpful, but from another PRO file HO322/1220 it is possible to identify one hundred of those three hundred nodes in the network, as shown by Network Gallery Image 6. Due to the lack of data we are unable to show the other routes from the twelve tier 3 TCGs connected to Worcester (Network Gallery Image 5) that must have existed, these being sideways routes to other TCGs and upward to Tier 2 EZC nodes. It is likely that most tier 3 TGC would have connected to two tier 2 EZC zone switchboards, as otherwise each of the six tier 1 ETSC would need around 50 tier 3 TGCs connecting to them. Trunk Subscribers ( Tk Sub ), the end users of the EMSS network, are connected to their nearest EMSS no matter which tier it is on. Some important establishments are connected to two different switchboard sites. There were minor changes during the life of the EMSS network, Carmarthen is shown on the map as a Tier 2 node with a route to Worcester but the was no corresponding route at Worcester. Perhaps like Salisbury which was replaced by Bournemouth, Carmarthen may have been replaced by another switching centre or amalgamated into Merthyr Tydfil. Calls could be connected across the whole country by only using the EMSS network. But in order to connect calls to people and organisations not directly connected to EMSS, circuits were also provided into the normal public network. At Worcester a group of 10 outgoing lines give access to local area customers and a further 10 outgoing lines for National Number Dialling. A small quantity of Operator Assistance 100, all the Priority Answer and all Emergency 999 circuits could be answered in the basement if it was necessary to stop using the normal operator switchboard on the top floor of the building. Trunk Subs at Worcester consisted of the Blue Light service, Police Tk Sub 1, Fire Tk Sub 8 and Ambulance Tk Sub 5. Additionally for local government Tk Sub 20; Worcester County Hall (Local Authority Emergency Centre) and Tk Sub 32; the Regional Government HQ RGHQ 9.2 at Drakelow Tunnels, Kinver. Also a few others to the County Showground at Malvern, for the GPO telephone caravans that attended such events. It is essential that EMSS users know the relevant Trunk Sub numbers of those they wish to connect to. As stated in the Trunk Subscriber topic above, the GPO operator did not know the identity of the called line, the caller just quotes an exchange and Tk Sub number, it wasn't possible to ask for example "Bedford UKWMO Group". With this in mind, the UKWMO circulated a list of the ROC Group and Sector controls along with their Trunk Sub number, this is reproduced below. Now declassified documents in the Public Records Office (PRO), reveal that all ROC Group and Sector Controls in the UKWMO were connected as Trunk Subscribers into the EMSS Network in 1972. Due to the "Confidential" security classification of the EMSS, little was known about the system by its potential users, the PRO file HO332/1220 shows this was of concern to the Civil Defence College at Easingwold as it inhibited the subject being included in their training courses. In February 1978 letter reproduced above, Mr R F Cumings, Deputy Director of the UKWMO wrote to Sectors. From time to time ignorance is expressed regarding the working of the Post Office Emergency Manual Switching System . 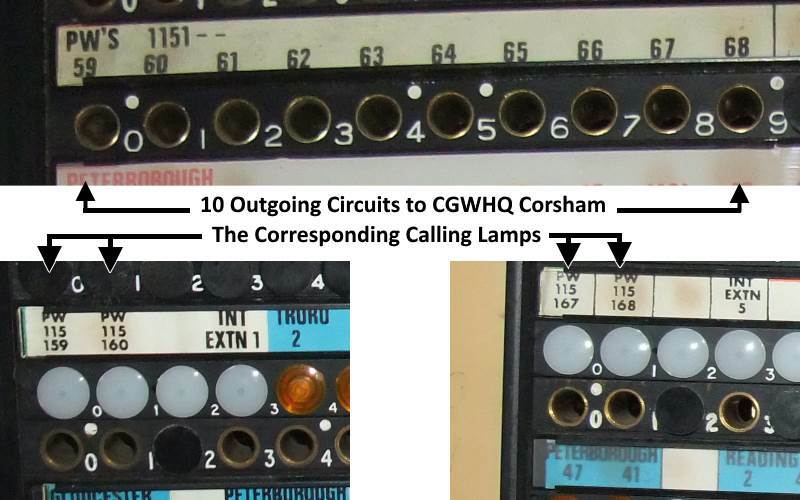 . .
De-classification of documents relating to the Central Government War Headquarters (CGWHQ) at Corsham, reveal that in 1968 Woodland Exchange had a total of 37 lines to EMSS switchboards around the country. The map shows the nine E.M.S.S. locations connected to CGWHQ, four are Tier 1 ETSC centres and five are Tier 2 EZC. 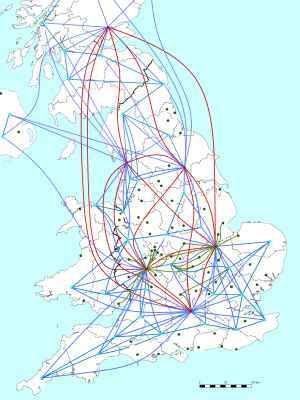 As a former GPO / BT engineer, I was puzzled how such a large communications centre could be hidden in the network. In recent years the archives reveal that most of this network was in the open to anyone who knew the code - the clever bit was that we didn't. The code was cleverly chosen to not to look any different from any other military or government location that people were used to seeing, so not raising any suspicions. Telephone Exchanges and Repeater Stations are identified by an Engineering Code, known as the THQ1141 code consisting of two or three letter codes. GPO Radio Microwave stations have a four letter code beginning with 'Y' and this was extended to include customers premises renting private wires (PW) also known as private circuits. These THQ1141 codes were published openly throughout the organisation. A series of 1141 codes having four letters starting with 'Q' were reserved for use at Government and Military establishments. However, these were controlled by Telephone Headquarters (THQ) and only released on a need to know basis. Once the CGWHQ was declassified and photographs of the telephone apparatus appeared on the Internet, it became apparent the 1141 code was 'QQCF'. The South West Communications Centre (SWCC) with the code 'QQCC' is next door to the CGWHQ, the archives show that many potential parts of the CGWHQ network terminate at the SWCC in peacetime and would be extended should the bunker need to be brought into use. The THG Archives hold a document, a P.O. Engineering Instruction: Lines, General A6131. A copy of this 58 Page document must have been distributed to hundreds if not thousands of GPO sites throughout the country, it was certainly not a secret document, giving a list of main underground cables and their maintenance control. This 1966 copy is Issue 14, regular updates would be issued when necessary. Armed with the THQ 1141 Code for the CGWHQ and SWCC, we can find a number of entries, representing direct cables. Additionally other cables may pass through CGWHQ en route between cities. How could the bunker at Corsham be disguised at the EMSS switchboards, where routes to other towns are printed on the switchboard label?. I had expected it might simply have a Trunk Sub number at each of the interconnecting EMSS but these would normally be single circuits not a group of them. At Worcester, there didn't appear to be a group of 10 Trunk Subs for Woodland and the name Woodland didn't appear anywhere. However on the face of the switchboard there are a series of 10 outgoing jacks marked as 'PW1151--' and each jack has an individual number. These numbers correspond with the 10 incoming jacks and calling lamps, marked PW115159 to PW115168. A Telecommunications Instruction in the BT Archives reveals that during the transition to war period, the peacetime 'PW Number' labels will be replaced with something more pertinent.
. . . an additional label, showing the circuit designation only, is required, which should be inserted in the switchboard. The "name" labels should be held in a suitable security container. Cabinet Papers from 10th June 1993, held in the National Archives at Kew, give a closure date. This decision was prompted by the Government Review of Emergency Communications (GREC) report. The papers are mainly concerned with the government 'Emergency Communications Network' ECN, but have many references to EMSS. CAB 134 / 5766 extract . . . The GREC recommended that subscribers to the obsolescent EMSS network, which had been maintained by BT in order to serve the wartime communications needs of central government, should be connected to the enhanced ECN. The EMSS was accordingly withdrawn, in stages, from 1991, and finally closed in February 1992, before which date all subscribers who had confirmed the need for access to an emergency network had been transferred onto the ECN. A network built to support the top two levels of the Emergency Manual Switching System, by the use of underground amplifiers for the underground cables. Contrasting with the public network in the sixties have ground level amplifiers and a mixture of underground and overhead cables. Special microwave network for defence circuits and EMSS circuits as an alternative to cables. A national network linking regional government, local councils and UKWMO headquarters. The Images from BT Archives are Copyright BT Heritage, licensed under a Creative Commons License and reproduced under the following terms.